Yeah, five years. See if ‘Cakes will comment on this one. Was my Samsung rant really the last thing to be on here? At the end of December, 2011 I bought a Samsung fridge – RFG237AAWP/XAA – from bestbuy.com A little over a month ago, about 4 and a half weeks actually, it stopped working and I lost a ton of food. Disappointing for a 6 month old unit, but these things happen I guess. After the first trip from the repairman, everything seemed ok… but after a few days, everything in the fridge was frozen. So round 2 of lost food. They came back and replaced more parts, thinking that would fix it – it didn’t. They came back again and replaced the same part they had the first time – supposedly with some engineer from Samsung on the phone with the tech confirming that was the problem. Nope, still nothing. So each of these repairs took at least two trips for the tech – one to diagnose, another to actually do something with the parts. Each trip requiring time off work to let them in to do their thing. Finally, last week I spoke with an “Executive Customer Relations” rep who said they would setup an exchange. Finally! Or so I thought…. Today, 4 days later, I get an email from them saying that since we bought it online with BestBuy, they could not designate a store to do the exchange, but they’d happily refund the purchase price. The problem, of course, is that I caught the fridge on sale – it’s about $500 more now. I’m actually back to the point that I was 2 weeks ago, so completely fed up with them that I was ready to just throw the whole thing out and go buy a new one. The complete lack of urgency on their part is amazing to me. The unit just turned 6 months old, and it hasn’t worked for over a month of that. So I’m shopping… I’m pretty sure I’ll just take the refund, not buy another Samsung, and basically tell everyone who will listen to not buy one. I don’t usually raise a stink about things, but this has just really tweaked me enough to use every outlet I have to encourage people to stay away from them. I should have stuck with my old Whirlpool. “Disappointed” is really the only word i can come up with. No one really seemed to care, and the amount of time and effort I had to put in to getting this stupid thing fixed has been ridiculous. And the customer service people weren’t bad, they just weren’t very good. The amount of phone calls I had to make – and twice I was given a wrong number to call, and once completely hung-up on when they tried to transfer me. Update 7/20/2012 – I just called to have them process the refund, and she said I need to send the receipt again because it wasn’t on BestBuy letter head. W.T.F. Honestly, this would be hilarious if it wasn’t happening to me. So that will take another two business days. Then, if I’m lucky, they’ll process the refund which will take 10-15. We’ll see what happens, but I might actually just pack this up. I originally set this site up when I was teaching for students to download assignments and whatnots, then I posted my skydiving stuff on it, then it just turned into random crap. I don’t really even use it for that anymore. So the running thread here has been fixing stuff. I won’t get into how I fixed a 2003 Grand Am stalling problem with $40, WD-40, and steel wool (because I did) but instead my HDMI issues with an Onkyo 606. The Grand Am problem required a fuel filter, some new plug wires, paying someone to get the old rusted fuel filter off, and cleaning the coil packs. This one was actually easier. Sorry LeRoy, I wasn’t going to take the torch to a fuel line. End result – the TX-SR606 seems to working even better than when I first bought it. No more drops, no more artifacts, and the sources seem to switch faster now. 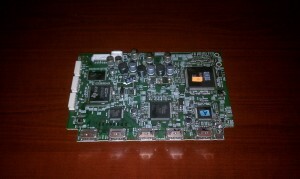 The repair was pretty easy, even though I haven’t picked up a soldering gun in years. I cannot condone this behavior. However, I was desperate. 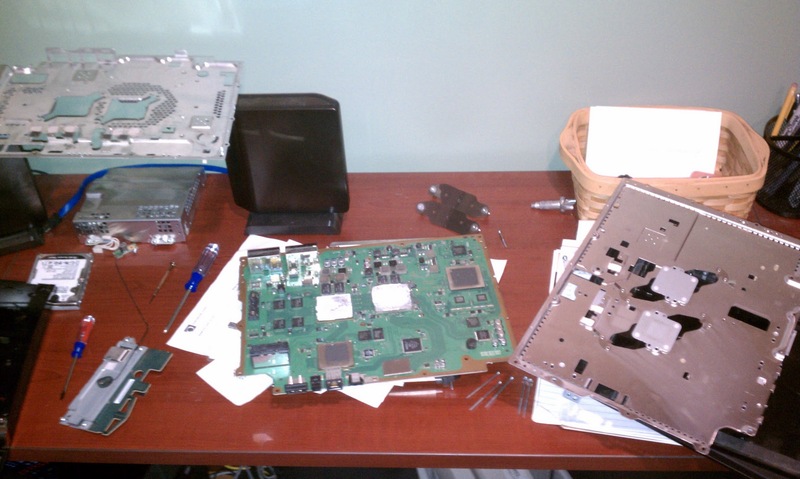 This past Black Friday (good timing) my ‘fat’ PS3 decided to shut off in the middle of marathon run of Borderlands. It happened while it was loading a new area, so I thought maybe it just crashed. Turned it back on, and after about 2 minutes it beeped and shut off again. I tried a few more times before giving up and asking the almighty Google what the problem might be. The more I read, the more I started to suspect heat issues. That diagnosis made sense – if I left the unit off for some length of time, I could get maybe 10-15 minutes out of it before it’d die on me. I hoped that would be long enough for a transfer of all my save data. A common problem with these older models is the thermal compound they use between the CPU/GPU and heatsink. I figured I could at least try that. What’s the worst that could happen? I’m out $5 worth of Arctic Silver and some of my time. 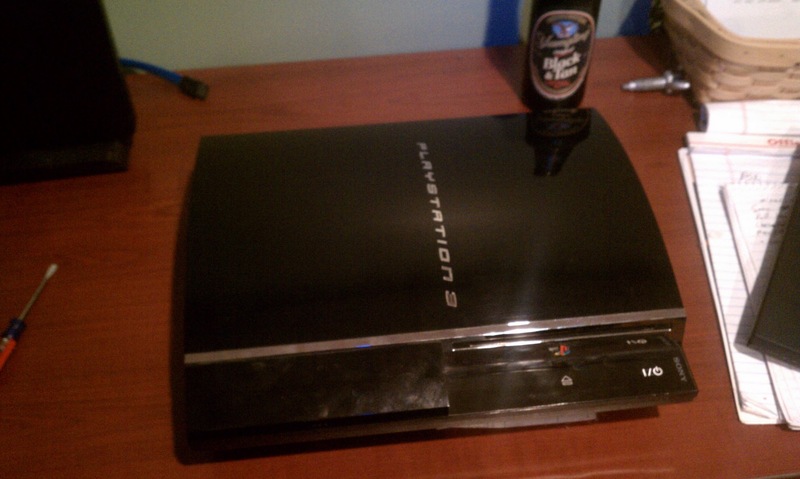 There’s surprisingly little to the PS3 inside. Almost the entire bottom half of the unit is heatsink and fan. Once the case is cracked, the bluray drive, power-supply, hard drive, and a bit of wireless gear is removed, the mainboard and heatsink are pretty easy to get at. There are all sorts of ‘quick fixes’ floating around using hairdryers, standing it on end, putting the whole thing in the oven, etc. Forget those, take the thing apart. Give it a good cleaning while you’re at it. Once I got the mainboard off the heatsink, I could see exactly what everyone was talking about. The thermal compound had turned into this chaulky gunk. Being the backyard do-it-yourselfer, I looked into my universal toolkit and pulled out some WD-40 to clean it off. 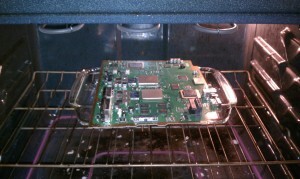 After cleaning the excess and letting it dry awhile, I decided to throw the mainboard in the oven for a bit. Some people have reported success with ‘reflowing’ the board – heating the solder just enough to get it to flow back where it is supposed to be. Normally they use a heat gun for this (a hairdryer won’t get hot enough) but again, I used what I had handy. I don’t encourage you to follow me. After letting it cool then applying new thermal compound, I put everything back together. I haven’t really stress-tested it since, but it stayed on overnight and completed the system transfer just fine. I’m not sure I’d trust it for much more than a bluray player at this point, or as a secondary one for gatherings… but at least my backwards compatible, 4 USB port having, memory card reading PS3 still lives. For now. Whole thing went together pretty well… considering I haven’t put a machine together in YEARS. I wanted a powerful system, but I didn’t want ‘server class’ because it’s sitting under my desk. It’s hard to find a consumer box with this level of RAM, Mobo, CPU without paying a fortune because they include the high-end video, sound, and Operating System components – which I don’t care about here. Here’s where I knew it was going to get tricky. I specifically picked an Intel motherboard hoping that the on-board gig nic would ‘just work.’ However, the one I picked was just a little too new and I couldn’t get through the install at all – the dreaded “vmkctl.HostCtlException: Unable to load module /usr/lib/vmware/vmkmod/vmfs3: Failure” message greeted me. Ok… probably the nic… let’s see what we have. ALT-F1 will get you to a console (yes, even though the install bombed) – login as root, blank password. The “lspci” command will show us (hopefully) what’s there. 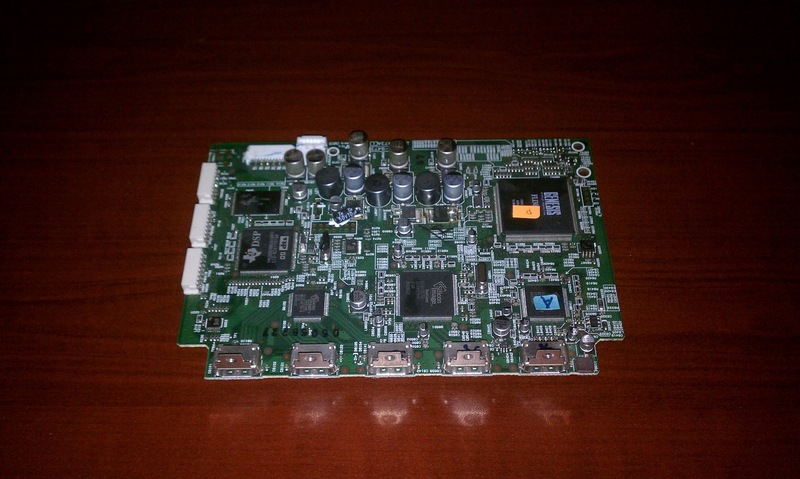 In my case, it did in fact show me a nic that was surprisingly in the pci.ids already for ESXi. In my case it was the Intel 82579V. I crossed my finger and ran “vmkload_mod e1000e” then “esxcfg-nics -l” hoping to see my nic appear (which then would just be a matter of editing the simple.map and running install again) Again, no joy. Big sigh, crack a beer, ponder my options. I really don’t know if I can pull off compiling a driver for ESXi… but I start looking for what it would take. It’s either that, or buy a officially supported card and hope the rest of the install goes well. Not sure I’m willing to do that yet… check flea-bay… eh. Maybe. I’ll think on it. Check back on vm-help.com and someone is already working on a new driver based on the 1.3.10a drivers! He came through with it (you’re the best Chilly!) so I took his driver and rolled my own install using this super-handy script. First, none of my installed drives came up as options to install to – the 1.5TB or the SSD I had installed. Bummer. Ok, so into the BIOS we go and change the SATA mode from AHCI to IDE. Still nothing. Try changing from IDE mode to RAID and WOO! There we go. Ok, so hit F11, ready to throw a party, and I get “Unable to find system image to install” Back to to Google. Found a couple of options to deal with this minor setback. Most of the advice on vm-help.com suggests installing 4.0 first then upgrading to 4.1. I found a great tidbit earlier on with problems installing from USB where ESXi seems to ‘forget’ you’re installing from usb and suggests creating a kickstart script to get around it. So I started creating that script and started the download for ESXi 4.0… but just for giggles, decided to go back to Varazir’s script and make a custom install CD first. I had been making a USB installation media just because it was faster and I thought I’d make a few coasters, but I was pretty sure I had everything else right this time, so tried making the CD. Boom goes the dynamite… no problems. 4.1 update 1 installed in no time using the CD. Just stood up a Windows 2008R2 VM, fixed the stupid slow-response console problem with it, and attached a USB device to the host and accessed it from the guest. Doesn’t look like it’ll support VMDirectPath, but I don’t think that will matter for this machine. Running converter to pull in one of my old VMs. Have a physical box to convert if that works. Only thing I have running under Workstation is a Linux box I use to play around with. Soooooo… more to come. Gonna install ePO and all that good stuff. We’ll see what happens. 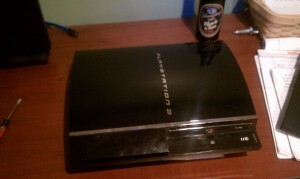 Also need to get my gig switch put in here. If my weather station will work in pass-thru, I think this’ll work out VERY well. If not… I’ll have an extra machine running until I figure it all out. Been an interesting couple of months. Been to a few more hockey games – season is almost over 🙁 – and did change jobs. Made a trip to Texas, visited Baltimore as well for the first time. Kind of neat seeing where our national anthem was written. Still nothing from the old, lost friends… but whatever. Reconnected with a few other old friends I hadn’t seen in awhile. Impromptu New Years Eve party was a f’ing blast. Yeah, I know, talking abotu NYE 3 months later. Even managed to hit two new disc golf courses in the last week or two. My normal course is under water! In geocaching news – I got Treeboy started and man has he started. In ~ 3 months he managed to find more than I have in years, he’s even hidden a few. And you should really watch for some of his coming hide – in a word, devious. My mother and nephew started texting me the other day (yes, my mother ‘texts’ – a long way from not being able to set the time on the VCR) asking is I had any idea where a cache could be hidden 1,000 miles away from me. I think I helped, but she won’t tell me. She thinks it’ll be more fun for me to find it on my own…. a thinly veiled ploy to get me to come visit. In movie news, I’ll just catch up here: my 4+ star ratings for the last couple of months: The Pacific, Despicable Me, Easy A (+++) How to Train Your Dragon, Winters Bone. There is some loss of social interaction. The normal BS around the water-cooler, going to lunch with ‘the guys,’ and dealing with people on a day to day basis. I saw all that coming – no big deal. The fortune saved in gas, not having a daily commute, rolling out of bed at 7:55am (or later) and having the flexibility to go take care of things during the day have all been huge benefits. Ok, the bump in pay might have helped. Many people have said “I don’t have the discipline to work from home” – the one thing I didn’t see coming was having to have the discipline to NOT work from home. You’re so plugged in, it’s so easy to sit down and start working at 11 at night just because it’s there. It’ll be interesting in the coming months to see how I adapt – this is all very new for me. For those who know me, this is something of a career change. I’m working for a company you probably know… it’s just… different. I’m not doing the techy day to day stuff any more. First of all, I think I’ve been to more sporting events in the last 6 months than I have in the last couple of years. Hockey games, Reds game, even made it to the Bengals/Steelers game (stupid Bengals!!) And, not that this is normally my thing, but I went and saw The Nutcracker too 😀 Hey, I’m all cultured and crap. Just seems like I’ve had something going on almost every weekend the last two months. By design I guess. Just been a strange time. Made a few new friends, lost a couple of old ones (and I’m still not sure why.) Hell, even made the first step towards changing careers – that starts in January, maybe more on that at a later date. Had you asked me at the beginning of the year where I’d be at this point, this is pretty far from where I would have guessed I’d be. For the first time in 11 years, I actually didn’t make a single jump this year. I didn’t really get my bike out that much either. Got more into other stuff though I guess – played a lot of disc golf (I’m actually getting halfway decent at it) and got a couple people hooked on Geocaching. I’ve created a monster there – Treeboy already has more ‘finds’ in 6 weeks than I probably had in the first year or so that I did it. And he’s already hid one and has another doozie planned. I can’t believe Christmas is a week away. I’ve bought one thing. Uhg. Well… it should be an exciting couple of months. Let’s see where it goes. I saw a trailer this morning on tv for a ‘new’ movie coming out – Let Me In – and before it gets to the title I’m thinking “I’ve seen this… it was a really good movie.” But then there were a few of the trademark (hollywood) horror-film strobe-cut edits thrown in. You know the ones: a convenient lightning bolt or passing car illuminates something scary for a second then the camera cuts away. And it’s not out yet. Why can’t Hollywood come up with an idea of their own? Let the Right One In was a fantastic movie, why remake it? And it’s only 2 years old!! I haven’t even seen this summer’s Karate Kid or A-Team yet. I’m almost afraid I’ll cry if I do. Come up with something original! Bad news kids, remakes/reboots (I hate that term) are already in the works for Highlander, Planet of the Apes, (again?!?) and even The Wizard of Oz. Is nothing sacred?